The Futures are up again. 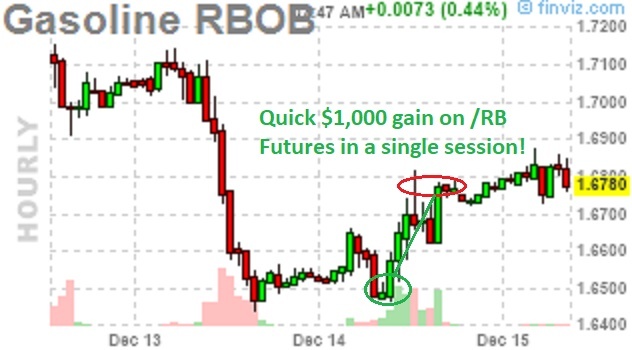 Gasoline (/RB) long at $1.65 – out at $1.675 for $1,000 per contract gains. Natural Gas (/NG) long at $2.66 – out at $2.71 for $500 per contract gains. So Merry Christmas and Happy Hunukkah to you all – now we can go shopping! I told you it was fun to play the Futures and that's why we don't mind cashing out during uncertain times – it certainly doesn't prevent us from making money. Even if we drop $1M to the sidelines, making $3,000 a day while we wait for the markets to cool off isn't a bad way to pass the time. Today we'll be looking for another chance to short the indexes, if they get back to yesterday's highs but, so far, no takers. Dow is closest (/YM) but only 24,635, very shy of 24,700 so our only active play at the moment is the Dollar (/DX) long at 93 again though we do still have active long trades on /NGV8 (October Nat Gas contracts) now $2.74 and /KCH8 (March Coffee) now $120.50 – but those aren't day trades. One commodity not doing well this winter is chicken wings, with prices down 30% since Football season started and Conservative commenters are blaming NFL protests for spoiling people's appetites but I'd say Republican policies which are destroying the buying power of the Middle Class are having a negative effect on $1/each wings. The same goes for Buffalo Wild Wings (BWLD), who blamed players taking a knee for hurting their business – where 9 wings are $13.49 and celery is EXTRA. Who says you can't make money in this market? 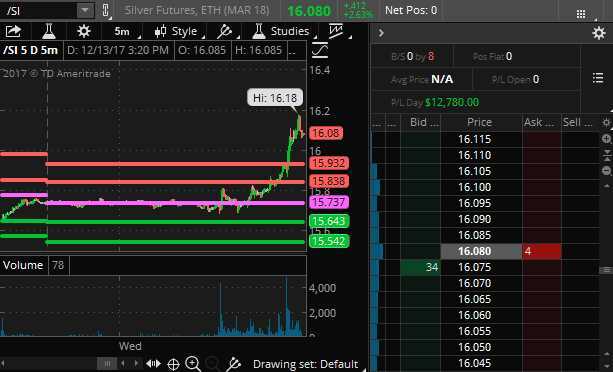 We actually picked up some Silver Futures (/SI) as they fell back to $15.85 and that's down $2.15 (12%) since September and our 5% Rule™ says that's a 10% drop with a 20% overshoot and, while that's no guarantee of a bottom (real support comes at $15.50) – it's worth a poke down here as we don't expect the Dollar to pop 94 very easily and Gold (/YG) is testing $1,250, which is good support on the yellow side. Yesterday's Fed Statement sent both gold and silver flying higher (and BitCoin lower) and we took the money and ran live, during the Webinar with a $10,000 overall gain on 8 contracts that gained 0.25 each at $50 per penny, per contract (the day's gain is coming of a dip). It's not that we don't still like gold and silver – it's just that making $10,000 in a week is good money – so why risk a reversal? If they don't pull back to give us another entry, then we'll find something else to trade (and we identified several in yesterday's Webinar). If ECB stays easy then Dollar likely to pop so I do like /DX long over 93 with tight stops below. I think /CL can be played long over $56.50 with tight stops below and /RB over $1.65 with tight stops below now. 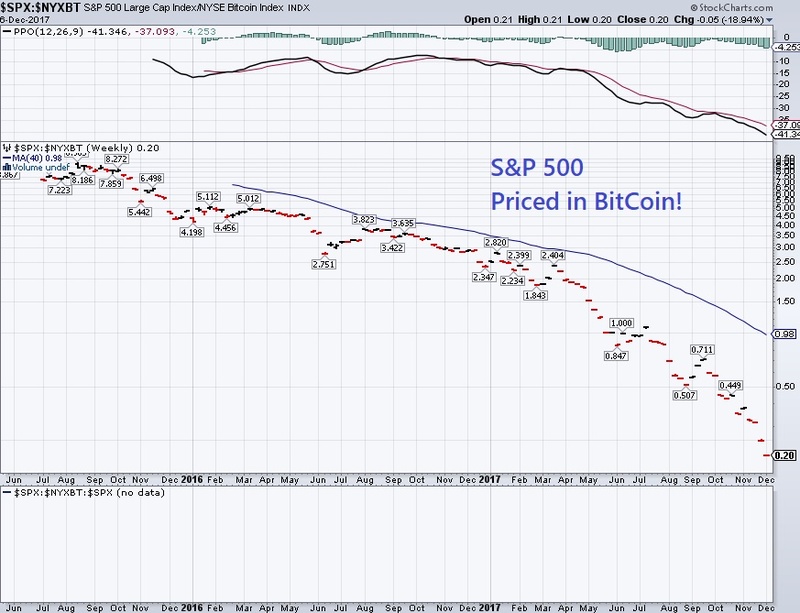 BitCoin has passed tulips in 1637 as the biggest bubble that ever existed. 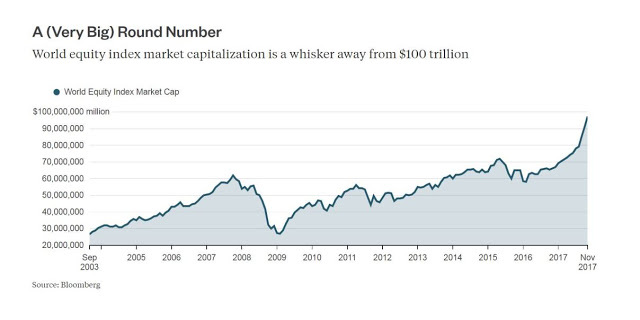 The S&P bubble (see yesterday's post) is only up 300% in 8 years – hardly a blip on a chart where BitCoins (/XBT) is now up 6,500% in 3 years. Amazingly, it was only two weeks ago when I said "We Will All Be Billionaires" if the markets keep growing at this pace yet the pace most certainly has continued, with our Money Talk portfolio (see yesterday) hitting +80% in yesterday's trading. There were no changes and no adjustments – just the same 4 positions going from +70% to +80% in two weeks while BitCoin went from $11,200 to $18,000 (+69%) and our GreenCoins went from 0.000220 to 0.000812 (+269%) before crashing back down to 0.000305 as we reminded people not to be greedy and take profits in yesterday's Live Member Chat Room. Of course the whole thing is ridiculous, but it's a ridiculous thing we can play with – so why not? We're still accepting GreenCoins (GRE) as payment for 2018 Annual Memberships during the month of December at 0.00044 so, if you can buy them for 0.000300, you're getting a 25% discount at the moment but I'd offer 0.000200 – as those lows are still filling if you are patient. That gives you a 50% discount on Annual Memberships so, assuming you wanted an Annual Membership anyway, it's a free way to go through the process of playing the cryto market and, if you get lucky, GRE pops again and you can sell them for 4x, which pays for the Membership (2x) and leaves you 2x in your pocket as well! 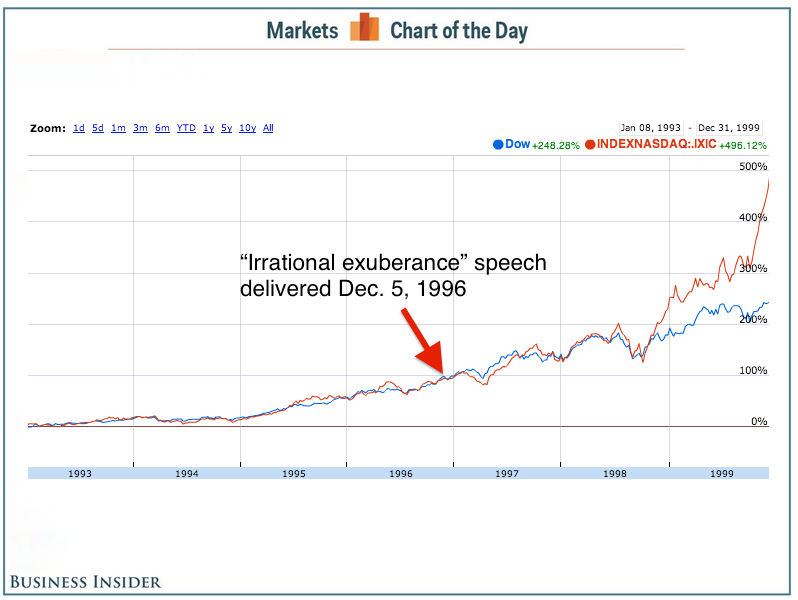 The Dow had just passed 5,000 at the time and, two years later, it was at 11,700 – up 134% AFTER the Fed Chairman said people were nuts for buying stocks. I don't know for sure if we were right to go to CASH!!! last week but it's not a permanent decision – it's simply something we're doing into the holidays and likely to remain until we see the Q4 earnings and 2018 guidance in January. 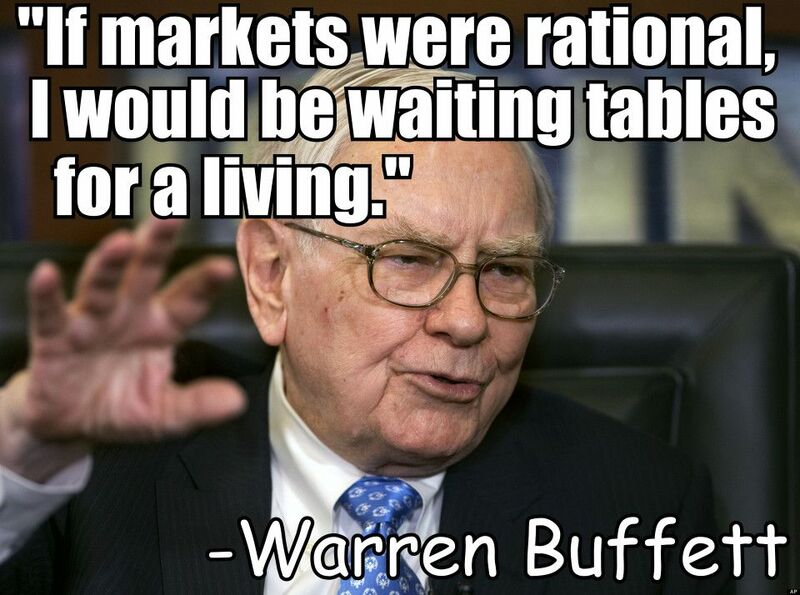 THEN we will decide which stocks we want to ride for the next 100% of the market rally – if such a thing is coming. As you can see from the chart, the Dow move was nothing compared to the Nasdaq, which more than tripled after his call. We just saw BitCoin more than double after JP Morgan's Jamie Dimon called it a scam and our GreenCoins (GRE) doubled yesterday and today they are up another 20% – that's a scam we can all enjoy! I was going to talk about BitCoin (/XBT in the Futures now), but screw that. Something just blew up at the subway near the Port Authority in Times Sqare, in NYC (7:45) - this is supposedly a picture of it happening but not verified (Twitter). The bomb squad is there and reports are someone has been taken into custody who looked like they had an explosive vest on but it's very fresh – we'll find out more as we go. My initial reaction is to short the S&P (/ES) at 2,652.5 as it's toppy anyway so I don't mind holding the short. Trains have now been stopped and evacuated. This is where Futures trading is a very useful tool in our toolbelt – we're able to quickly react to news and protect our portfolio or, in this case, since we already cashed out, make a little money off the tragedy (sorry but it's true, we're like vultures!). I was just in Times Square yesterday with my kids and their friends and we took the subway home last night – right through the Times Square Station. What could possibly go wrong? As you know, we are in CASH!!! but I'll short the S&P Futures (/ES) today at 2,650 and the Dow at 24,300 (/YM) and the Nasdaq at 6,380 (/NQ) and the Russell at 1,530 (/TF) because I think we're going to sell-off a bit into the close. We generally use a 2 out of 4 rule for shorting and short the laggards as 2 of the indexes cross under and then, if ANY of them cross back over, we get out. So that limits our losses while giving us a nice possibility for gains. So far, under Trump, we've added 250,000 less jobs than under Obama in his last 9 months and today should make it worse as only about 195,000 jobs are expected to have been created in November, Trump's 10th month in office. September was the real disaster for Trump, with just 20,000 jobs created but last month was a bit of a comeback, with 261,000 jobs but that may get revised lower – so watch out for that. It wouldn't matter if we had an ordinary President, but Trump is big on keeping scores and he promised the moon and the stars on jobs and has, so far, woefully failed to deliver. Much worse than not delivering enough jobs is the horrific erosion of wages for all jobs since Trump took office. Due to reversals in labor policies under the Trump Administration, hourly earnings growth has slowed 0.4% since the election and, while that may not seem like a big deal, when you multiply it by all 168M employed people it's the same as losing another 672,000 jobs worth of salary. Creating jobs at slave wages was never the goal of the Obama Administration while Trump actually ran on a promise to put people back to work in coal mines which, LITERALLY, has songs written about how it's the worst job on the planet. Obama's job plan was to create a new, renewable energy economy and put $90Bn into funding companies like Solyndra, which lost $535M and was the GOP excuse for killing the program but it was too late to kill the jobs that were created and today, 10 years later, clean energy jobs outnumber coal, oil and natural gas combined. And those are, generally, high-paying jobs with great growth prospects that are bringing manufacturing back to America. http://welcome.philstockworld.com/wp-content/uploads/2015/09/PSW-Adooma-logo.png 0 0 Phil http://welcome.philstockworld.com/wp-content/uploads/2015/09/PSW-Adooma-logo.png Phil2017-12-08 13:13:312017-12-08 13:13:31Non-Farm Friday – Is America Working? Thank goodness we still have our BitCoins! We may have cashed out of the market but you'll have to pry our BitCoins out of our cold, dead fingers. No, only kidding, this is silly too – we can't wait to sell – we're using tight stops now. PSW Investments bought their BitCoins for $600 each two years ago, so it's a nice gain and we should lock it in – the cash will make a nice Christmas gift for our partners. 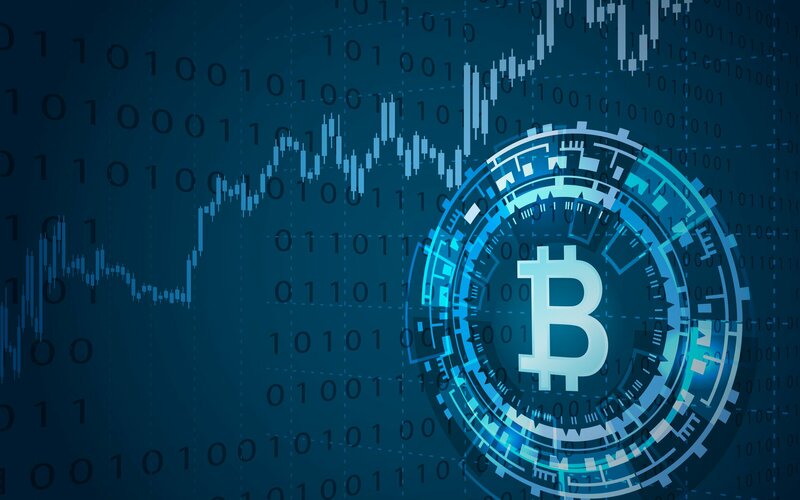 We still have our GreenCoins (GRE) though and we're accumulating more of those because each BitCoin's worth of those we bought is now worth $24,525 at 0.00327, so GreenCoins are doing 50% better for us than BitCoin – and they are far earlier in the run-up cycle. Of course, in order to buy a GreenCoin you need a BitCoin and then you have to go to the CoinExchange (where it's ranked 93rd) and trade the BitCoins for Greencoins. That's one of the reasons BitCoins are exploding in value – you can't buy any other CryptoCurrency without first buying a BitCoin so millions of speculators are holding BitCoins in their wallets (like us, frankly), simply because they were using them to buy other coins and ended up with some change. We have no regrets on Monday's call to get to CASH!!! Now, it is possible that it's a self-fulfilling prophesy as I went on TV, live at the Nasdaq on Monday Morning and told their viewers why I thought the market was drastically overbought – using very simple math that simply demonstrates that it's not likely that, after taking 200 years to get to $65Tn, the global markets were going to be able to justify a $35TN (53.8%) gain in 12 months. What's most amusing to me is the number of people on Social Media who feel that they need to defend the bubble and come up with dozens of reasons why I am wrong and why "this time is different" because of Trump's Tax Plan, the Global Recovery, Emerging Markets, Easy Money Policies, the Sharing Economy, Robot Automation… All good reasons we should be having a rally – but not this INSANE, RIDICULOUS, UNSUSTAINABLE rally and, frankly, the whole time they are talking I just keep thinking "Wow, people just don't understand the basic concept of math, do they?" It's the same math I used in 2010, when I wrote: "The Worst-Case Scenario: Getting Real With Global GDP!" when I used the same MATH to show that the markets should be much higher than they were. 7 years later, the math hasn't changed, the markets have. I'm not your enemy just because I'm trying to tell you the markets are overbought any more than your doctor is when he tells you your cholesterol is too high. I've been warning you for a long time and I've prescribed hedges to make sure our portfolios didn't suffer any major damage but now, unfortunately, the untreated condition has gotten worse and we need to operate/liquidate – IMMEDIATELY – to prevent serious damage to your finances. Tempting Tuesday – Stop Buying that Dip and GET OUT!!! 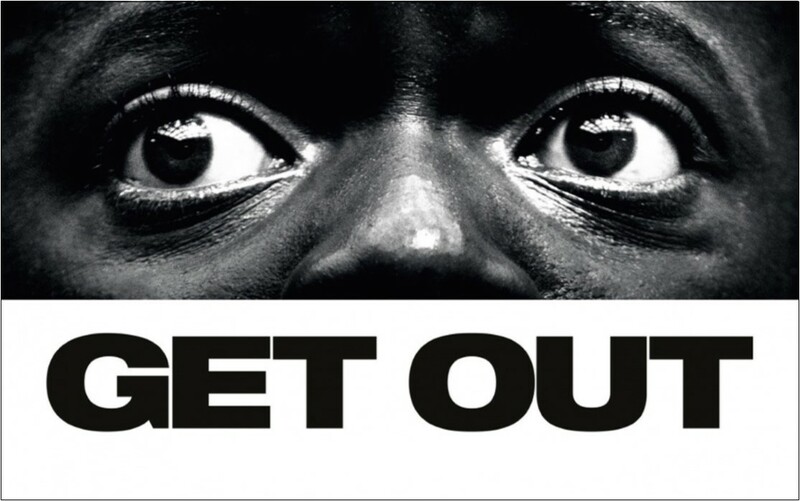 In this year's horror hit, "Get Out" the main character gets his warning just one time, early in the film. I don't know if it's early or late in the Stock Market Film but I did, very clearly, tell people to GET OUT!!! in yesterday morning's PSW Report and I repeated that warning live at the Nasdaq at 10:30, causing the index to drop 50 points (sorry). There may have been other factors in play – but I'll take the credit/blame for this one. http://welcome.philstockworld.com/wp-content/uploads/2015/09/PSW-Adooma-logo.png 0 0 Phil http://welcome.philstockworld.com/wp-content/uploads/2015/09/PSW-Adooma-logo.png Phil2017-12-05 12:50:232017-12-05 12:50:23Tempting Tuesday – Stop Buying that Dip and GET OUT!!! That's right, the GOP Senate passed the Trump Tax Plan when all the GOP Senators voted for it – what a surprise. In other news, water is wet. Still, the markets are acting like it's a surprise with the Dow up 227 points in pre-market trading and that's up about 500 points from Friday's lows – in that brief moment we though Trump might be arrested before they pass the tax bill. Now it looks like he won't be arrested until after the bill is signed – so all is well, I suppose. Dow 24,500 is up is up 4,500 (22.5%) from the start of the year and up 6,500 (36%) since the election. That's nothing compared to BitCoin (see this weekend's notes on that subject) which is up 11,000%. 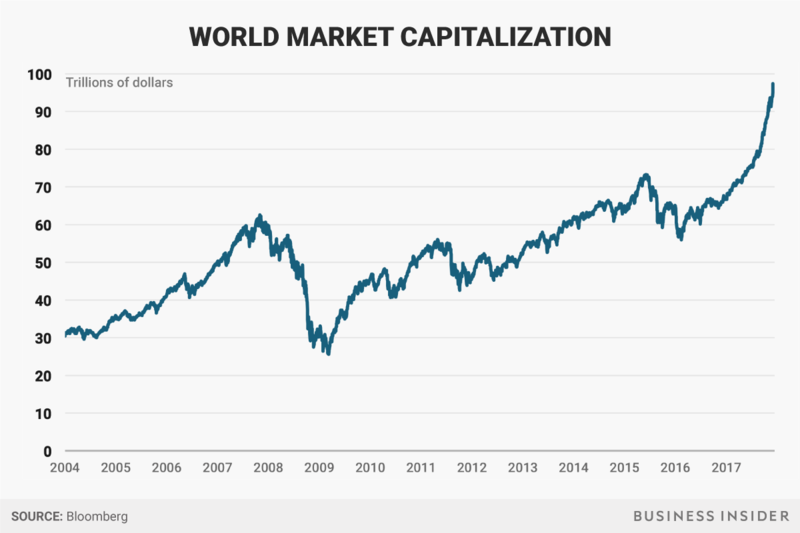 Still, 36% is a lot and the Global Markets have driven higher as well, as one might expect but, as we were discussing in our series of market value discussions last week – the reaction is now far exceeding the reality. For example, in November of 2016, the total market capitalization of Global Markets was $65Tn. That's about the same as our Global GDP ($80Tn), so not unreasonable. Unfortunately, now it's not reasonable at all as we're about to cross (or may cross this morning) $100Tn. That's up $35Tn (53.8%) in 12 months. 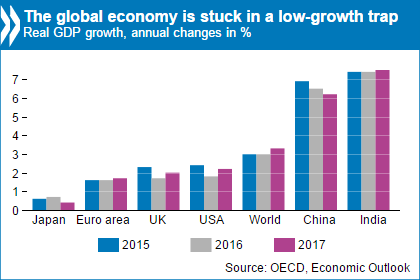 Global GDP grew 3.4% in 2017 so let's say that's a gain of $3Tn . The question then is – where did the other $35Tn of market growth come from? The answer is, of course – Fantasyland – this is completely ridiculous. 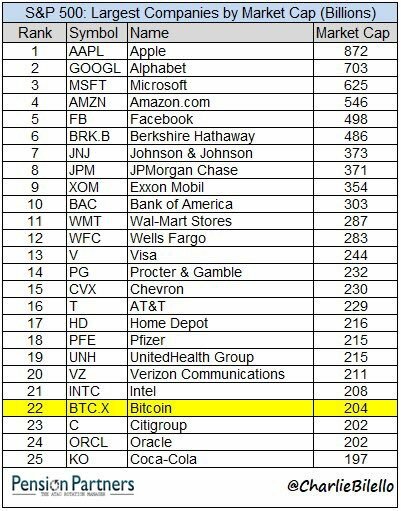 You may think "tax cuts" are a good explanation but US Corporations paid just $411Bn in taxes in 2016 even is you took 100% of those taxes and drove them back into profits and mulitplied it by the S&P's insane 27x earnings multiple – that would only account for $11Tn and we'd still be $21Tn short, or about 20% of the total market cap.